Israel Railways has just added 72 more cars to an order for 150 double-deck coaches, with latest delivery expected between 2014-2015. Israel Railways (ISR) this week signed an order for 72 additional double-deck coach cars from Bombardier Transportation, in addition to the original 150 coaches ordered as part of a framework agreement signed in October 2010. This week's contract, worth $158 million (122 million euro) brings the total number of new double-deck cars for Israel Railways to 222. The new coaches are an improved version of the trains currently in operation. The first coaches of the improved model entered passenger service on December 1, 2011, according to a release by Bombardier. Each double-deck train is capable of carrying approximately 900 passengers, according to Jean Bergé, Vice President Sales, Mainline and Metros, Bombardier Transportation. Delivery of the cars are expected to take place between March 2014 and February 2015. Bombardier manufactures and tests the coaches at its Görlitz plant in Germany before they are completed by Bombardier's partner in Israel, the Dimona-based company Matar. Although Bombardier Transportation is headquartered in Berlin, the Bombardier corporation is headquartered in Montréal, Canada. “We are extremely committed to bringing our expertise and our state-of-the art technology to Israel and we will support ISR in providing a reliable, high-capacity means of transport, ready to support future growth," said Yossi Daskal, chief country representative of Bombardier Transportation in Israel. 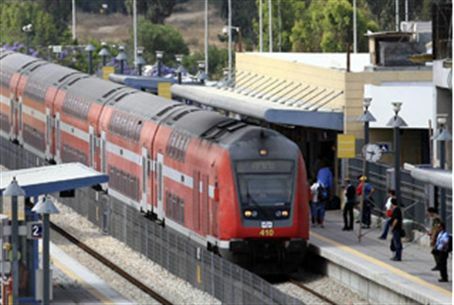 The Israeli public transportation market is growing rapidly, and there is a clear demand for more trains at shorter intervals to make passengers' journeys more comfortable, Daskal added. To further reduce the use of private cars, Israel is also developing Light Rail Vehicle (LRV) systems for several lines, including the new Light Rail that now operates in Jerusalem.